Freestanding Corian Kitchen with multi-functional solutions that adapt to any space. The freedom to customise colours and materials with a modern and informal look. Thanks to the use of the colour, of the visible equipped wall, reduced thicknesses of the doors and worktop in Corian, this important composition is modern and informal, and can be easily re-configured for spaces of any dimension. The 12 mm thick doors applied to this K6 composition are made in aluminium honeycomb, an aeronautical technology that allows obtaining lightness and dimensional stability. K6 is presented as double linear composition with corner layout. 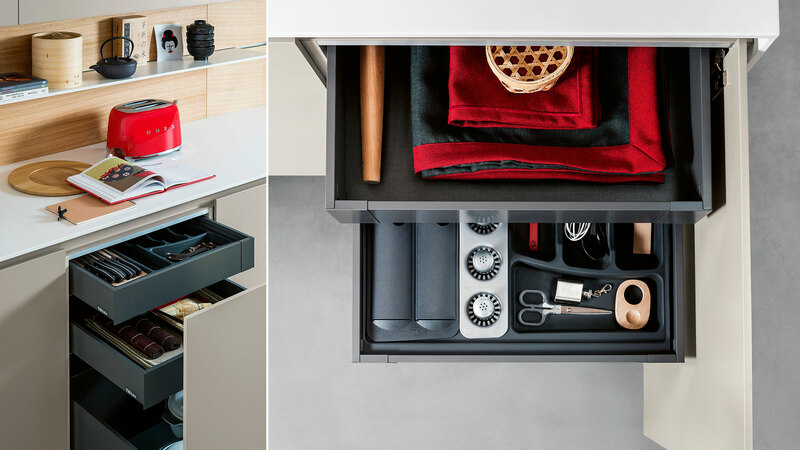 Seven bases equipped with appliances, pantry compartments and drawers inside the doors, framed by a 12 mm Corian top that descends on two sides, from the worktop. The work area features assembled sink in Corian, induction hob, dishwasher, hood integrated in the wall unit, extractable recycling bins, pantry compartments and drawers inside the doors to organise the space neatly. 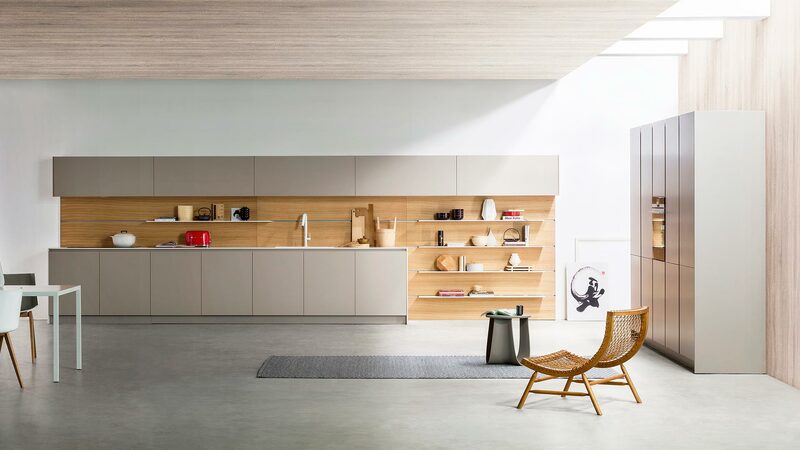 The series of wall units with vertical opening top the equipped wall with back in rovere naturale taglio sega and lacquered glacier white opaco visible shelves. 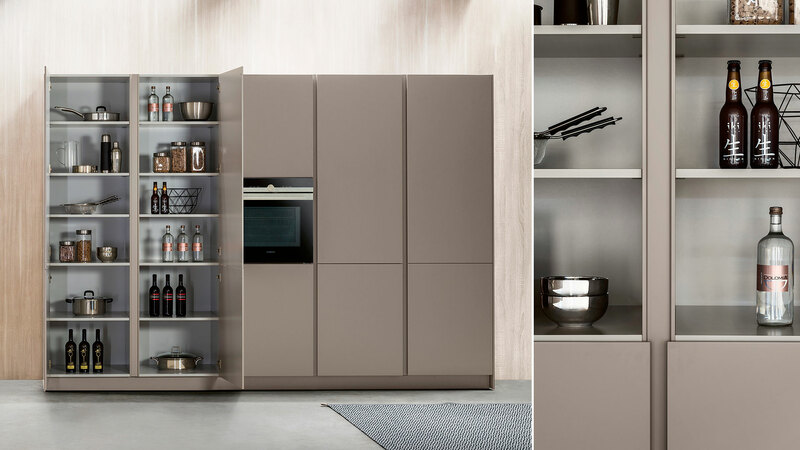 The five columns are finished in lacquered grigio alpaca and equipped with pantry compartments, oven, refrigerator and freezer. 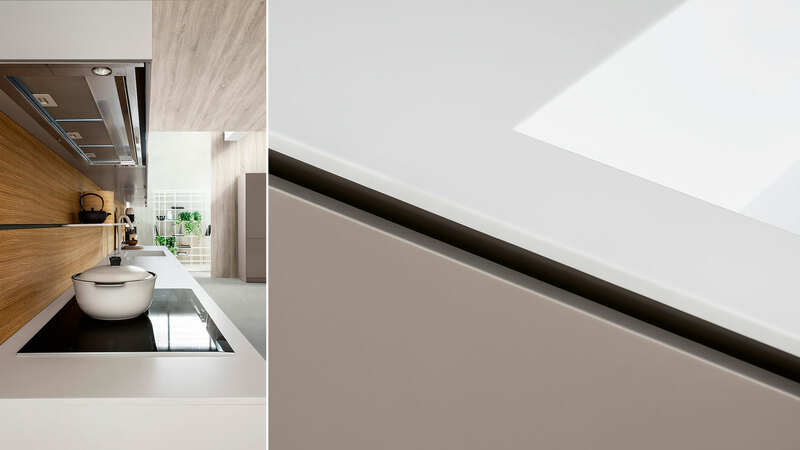 The K6 model features “C” grooves that allow housing the door, punctuating at the same time the composition, marking the vertical divisions of the columns and raising the worktop from the bases, exalting the sense of lightness if matched to reduced thicknesses. 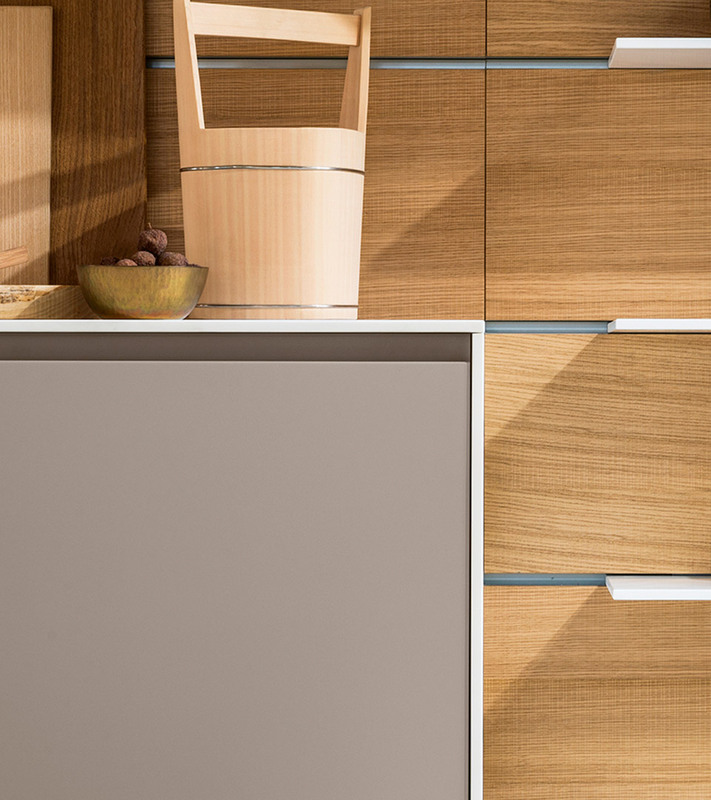 The hood is integrated to the wall unit without altering the compositional linearity. The solution features integrated dichroic lights and triple, independent filtering system. The wall unit features electrically-assisted tilt opening that allows rising and lowering the door by slightly touching it with a finger. The boiserie allows embellishing the vertical space with great versatility, introducing visible compartments for a practical and custom kitchen. The solution consists of a wall-mounted structure, horizontal guides, vertical panelling customisable in all the finishes featured in the catalogue. 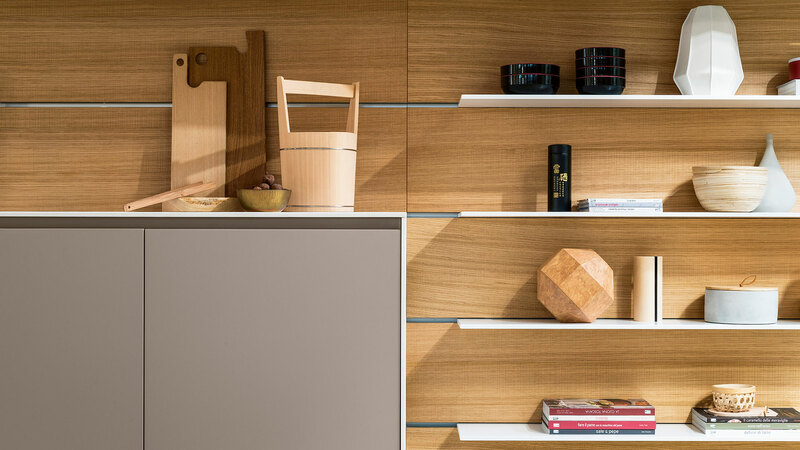 The shelves are inserted with a simple gesture, and can be in crystal or aluminium honeycomb, customisable in all the colours featured in the catalogue. Modular kitchen system available in all TM Italia finishes. Doors and fronts may be 12mm, 22mm or 28mm thick; they have a straight edge. The opening grip is a groove of extruded aluminium profile attached to the structures. Doors and fronts with 12mm thick has an interior door structure in aluminum honeycomb. The concept is available in a selected range of finishes. 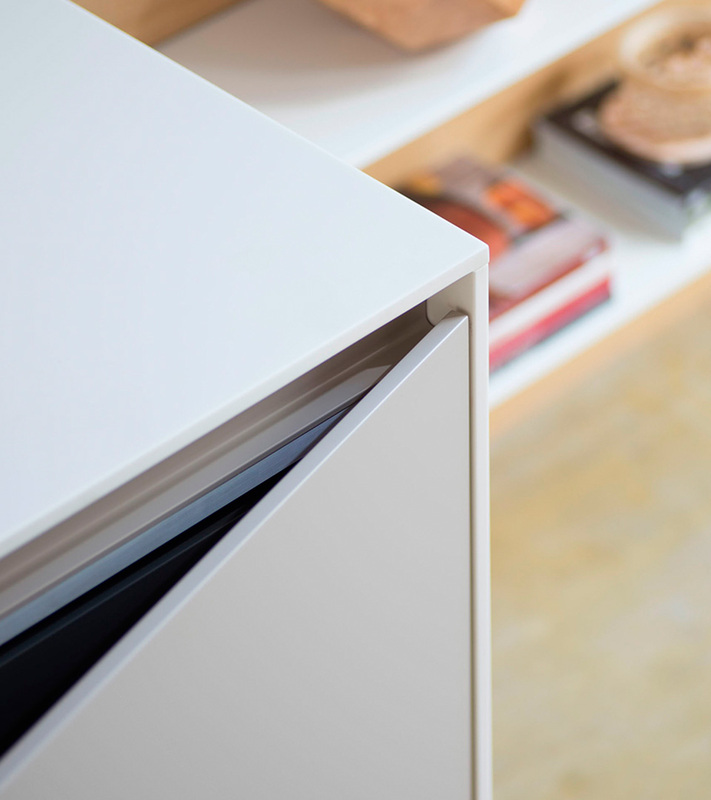 The wall units of this concept are provided with a grip handle recessed on the bottom structural panel. Each concept marks out our kitchens, making them unique in their shapes and details.